DiBella Entertainment and TGB Promotions promoted a pair of world title bouts at the Barclays Center in Brooklyn, NY, over Showtime Saturday night. Tonight’s attendance at Barclays Center was 14,069. WBC Heavyweight Champion Deontay “The Bronze Bomber” Wilder, 40-0 (39), of Tuscaloosa, AL, came from behind to stop the No. 3 Contender southpaw Luis “King Kong” Ortiz, 28-1 (24), of Cuba and Miami, FL, at 2:05 of the tenth round to retain his WBC title. In the first round Ortiz uses his jab well keeping Wilder from throwing punches. Ortiz landed combinations keeping Wilder off balance. Wilder finally threw a right that landed but got countered by an Ortiz left to the chin. In the second round Wilder continues to back up and hesitate to throw the right. Ortiz slipped per referee David Fields. Wilder went in after him but caught to a countering left to the chin. Ortiz backed Wilder into a corner and landed a lead left to the chin. In the third round Ortiz continued to come forth and seems to intimidate Wilder. It took almost two minutes for Wilder to land a right hand. Ortiz with right hand low keeps the left high to avoid a Wilder right. In the fourth round Ortiz kept landing more. At the halfway point of the round Ortiz lands a lead left rocking Wilder. In the fifth round the fans continue to let Wilder know he’s not doing enough. The defense of Ortiz seemed to bother Wilder from throwing his right. Wilder seems concerned about the countering power of Ortiz. Wilder drops Ortiz with a right hand just prior to the bell. In the sixth round Wilder finally lands a right to the chin of Ortiz. Wilder rocks Ortiz as Wilder starts landing his right to the head of Ortiz. Halfway through the round Wilder lands a left hook to the body of Ortiz. 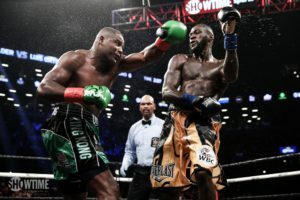 In the seventh round Wilder rocked Ortiz who came back having Wilder out on his feet with a left and a right hook having Wilder barely making it to the end of the round. In the eighth round Ortiz keeps coming forward rocking a back pedaling Wilder. Wilder measured with his left but fails to throw the left fearing a counter from Ortiz. Ortiz keeps coming forward out landing Wilder. In the ninth round Wilder is more aggressive but landing a right gets countered by an Ortiz left to the chin. Ortiz seemed to be tiring. Wilder rocks Ortiz with a right to the chin with seconds to go but got hurt with an Ortiz counter. In the tenth round Wilder is using his jab well. Both landed at the same time. Ortiz went down but referee David Fields called it a slip. Wilder went after Ortiz who looked exhausted and dropped Ortiz with a right hand and left hook. Ortiz barely beat the count but referee Fields left him go and Wilder went on the attack dropping Ortiz with a right hand uppercut ending the fight. What an ending by Wilder. Interim IBF World Super Middleweight Champion southpaw Andre “The Resurrected” Dirrell, 26-3 (16), of Flint, MI, took a beating in losing to the No. 3 Contender Jose “Bolivita” Uzcategui, 27-2 (23), of VZ and Tijuana, MEX, who wins the interim IBF World Super Middleweight title, at 0:02 of the ninth round. In the first round Uzcategui started the action with a counter right to the chin of Dirrell. Dirrell landed a hard left to the chin of Uzcategui knocking him off balance. Uzcategui landed a 3-punch combination starting with a right to the head, left hook to the body and another right to the head. In the second round Uzcategui started with a 3-punch combination. Uzcategui landed another lead right to the chin of Dirrell and followed with a flurry of punches before Dirrell landed a return punch. Dirrell landed a lead left to the chin of Uzcategui. Dirrell continues to try to hold off Uzcategui with his jab but it doesn’t keep from getting hit with a lead right. In the third round the same pattern continued until Dirrell finally blocked an Uzcategui lead right. When Dirrell finds himself against the ropes he is asking for trouble. A body shot at the bell dropped Dirrell but referee Ricky Gonzalez didn’t know what to do so he called nothing. In the fourth round Uzcategui landed four punches to the head as Dirrell stood in front of him. Uzcategui landed a right to the chin of Dirrell and followed with a left to the chin of Dirrell. Dirrell counters with a triple jab but still gets caught with an Uzcategui right hand. In the fifth round Uzcategui picks up where he left off with one right after another to the chin of a wide open Dirrell. With half a minute left in the round Dirrell lands his hardest punch a left to the chin of Uzcategui. Uzcategui took over the last half minute. In the sixth round Uzcategui picked up where he left off with rights pounding on Dirrell’s chin. It’s been an easy night for referee Gonzalez with few clinches. Dirrell rocks Uzcategui with a left to the chin. Dirrell ends the round with the same punch to the chin. In the seventh round Dirrell is back on his bike. Both boxers exchange punches with Uzcategui holding the edge. Dirrell started showing swelling around his right eye. Just prior to the bell Dirrell avoided a right and countered with a left hurting Uzcategui. In the eighth round Dirrell takes plenty of leather from Uzcategui and lands a left uppercut to the chin. Dirrell switches to orthodox landing more power punches than southpaw but goes back to southpaw. Uzcategui landed several hard punches causing plenty of swelling on the face of Dirrell. Dirrell’s corner threatens to stop the fight and they do. Dirrell was beaten from ring post to ring post for the entire 8 rounds. He had no confidence and quit in the corner. It was a wise decision on his part. “I was a little surprise when the fight was stopped and I know I predicted it would be stopped in three rounds. It was clear in the first fight that I would be even better in the second fight, “said Uzcategui. “It was a great fight. I had to earn this win. I knew Ortiz would be a great opponent with the skill set that he has. I wanted to prove to myself and to the world that I am the best. “This is a fight I took with great risk so that I could prove to the world that I’m the best. We each put on a great performance and I think the fans were happy they were here. I always give the fans in Brooklyn a great fight. “It was a great fight and I performed well. I thought I was up on the scorecard going in to the (tenth) round, but it’s heavyweight boxing and you never know what’s going to happen. “I almost had him and I think I would’ve if there were a few more seconds in the round. “I thought I was going to get a rhythm earlier. I thought I was winning the fight. This is heavyweight boxing and he caught me with a great shot. He’s a great champion. “Wilder was definitely saved by the bell. I thought I had him out on his feet. But you have to give him credit, he weathered the storm.